As fall slowly fades into a forbidding Pittsburgh winter, crickets are probably the last thing on our minds. Their chirps died down over a month ago, and even the stragglers that found their way into our homes, letting out irritating and impossible-to-locate shrills at odd hours, have disappeared. 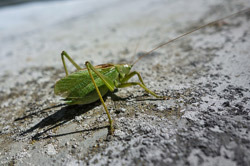 However, an unusual Ohio farm hopes to bring crickets back into our thoughts – and our kitchens. Just over a year ago, urban farmer Kevin Bachhuber founded Big Cricket Farms in Youngstown, Ohio. His mission? To raise gourmet crickets for public consumption. If you’re anything like me, you’re probably feeling a bit skeptical at this point, not to mention a bit queasy. Bugs? For dinner? Don’t write it off just yet, though. Edible crickets might just be the future of the sustainable food movement. As we all know, protein is an essential part of a balanced diet. It’s in our bones, muscles, skin and tissues. Over 10,000 types of proteins come together to create the enzymes that keep us up and moving every day. Because of this, it’s recommended that adults consume at least 8 grams of protein for every 20 pounds of body weight. When we think protein, we often think meat, and that’s because animal sources of protein provide all the amino acids we need conveniently packaged together, along with the essential nutrient Vitamin B12. Considering recent revelations of health risks linked to processed meat handed down directly from the World Health Organization, though, it might be time to add alternative sources of protein to our diets. That’s where the crickets come in. Consider this: one pound of usable beef requires 25 pounds of feed and 2,000 gallons of water. The same pound of crickets requires two pounds of feed and a gallon of water. With a world population clocking in at seven billion and counting, that’s a considerable amount of resources saved. And even if you’re not out to save the world, your body can reap the benefits of a couple crunchy crickets, since dried crickets in their natural form boast 65 percent protein, while dried beef only hits 50 percent. Still not convinced that a mouthful of insects is right for you? You might want to keep in mind that the FDA has standards for the accepted amount of “food defects” in processed foods, and that the approved levels are surprisingly high. In peanut butter, for example, you can expect to consume up to 30 insect fragments per 100 grams. Why not cut out the middleman? Okay, you might say. I’ll bite. What do they taste like? Are the wings still on? Will they pair well with this vintage Merlot? According to Big Cricket’s website, the gourmet crickets are stripped of their antennae, wings, and legs, and offer “a delicate, nutty flavor, a medium crunch and stylish banding along their backs.” And if you don’t want the full-blown cricket experience, be reassured: dried crickets often assume the flavor of whatever food they’re added to. And if you aren’t sure where to start, the farm offers some recipes to stimulate your imagination. Want your protein with a sugary kick? Try the caramel cricket crunch. In the mood for Italian? Whip up some tasty cricket pesto. The options are limitless. Big Cricket Farms may be one of the first to thrive in the micro-livestock business, but it certainly won’t be the last. According to a CNBC article written this past May, the market is predicted to grow substantially in the next year, and chain grocery stores will soon be featuring items such as cricket flour. So put aside your fear, pick up your fork and keep yourself at the forefront of the protein revolution. Eating bugs isn’t just for playground dares anymore – it could be the most efficient and environmentally friendly way to keep yourself healthy.